Ever since adding an iTunes gift card to my account, I'm getting verification requests like crazy. I can't even download free apps. It takes me to my payment info and when I try to select none, I continually get a message under the payment info that says "you must verify your payment info to continue"
I don't want a credit card on file and would really like the none option to work. My ID shows I still have iTunes credit. Apple is simply trying to make it easier to purchase apps if you decide to do that in the future. Providing the security code on the card lowers the fees Apple pays to the credit card processing company since it is evidence you are in physical possession of the card. You aren't required to provide a credit card at all just to sign up. 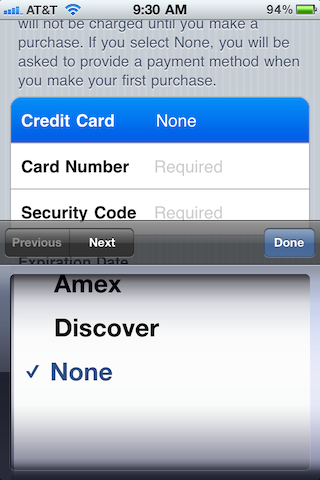 When you are prompted for the credit card type, Apple gives the option to chose "None". If you choose this while purchasing a free app, it will allow you to sign up without a credit card. Apple provides walkthrough steps for doing this on both a computer and on an iPod touch or iPhone. If this method is not available in your country but your country does have iTunes Store gift cards available, you can purchase one gift card and use it to create an account. You'll have to pay a little up front of course, but you won't have to provide a credit card before starting to purchase the free apps. If you bring an Apple ID to the store that exists (instead of making a new one), you are not presented with the None option. Alternatively, clicking Redeem in the Quick Links box on the main page of the Mac App Store may allow you to bypass steps 1-5. You also can just put in payment method one time, do not make a charge and then remove it. Lastly, someone that's a family organizer can ask you to join and then you would leave once your account is "verified" into the app store. Does Apple think you have an unpaid balance? That cause cause the "payment verification" requests. To see if that's the case, check your purchase history. If you do have an outstanding balance, once you pay it you should be able to select "none" as a payment option. I had the same issue and the cause was that my salutation was missing from the info. You can fix this by selecting none and then scrolling down to and make sure all the address fields are complete. You most likely have an unpaid order or a authorisation issue with your bank. you obviously can't select "none" until the order is paid. Why am I asked for a credit card number to download a free app? Why is my App Store saying it needs my to give it my credit card? How can you stop “Verification required” when installing free apps? When I try to download an app, it says Verification Required? Why when I try to download a free app on my iPad it says Tap Continue and Sign In To View Billing Info?